THIS ITEM IS NOT AVAILABLE AT PRESENT. WE WILL NOT BE GETTING ANYMORE Star Wars Rebel Pilot Cosplay Mini Backpack. From the Star Wars collection by Loungefly. 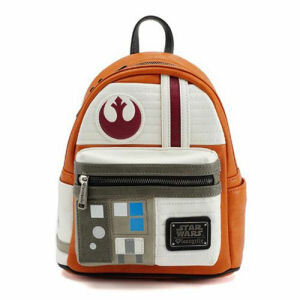 Star Wars Rebel Pilot Cosplay Mini Backpack. This faux leather mini backpack with applique and embossed details to go along with the printed. Measures about 10.5 inches tall by 9.5 inches long by 4.5 inches deep. Ages 13 and up. All Loungefly items are vegan friendly - unless otherwise noted.